Doctors of Optometry Canada are encouraging parents to ensure their children’s eyes are protected this summer, as they are at greater risk of damage from UV rays. The crystalline lens in children’s eyes is less capable of filtering UV than in adult eyes, resulting in greater risk for internal eye damage later in life. This is particularly concerning as children spend more time outdoors than the average adult. 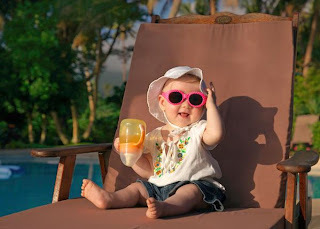 It’s estimated that children receive approximately three times the annual adult dose of UV and ensuring a child is wearing sun glasses to shield their eyes from harmful ultraviolet (UV) radiation is just as important as putting on sunscreen to protect their skin. Just as the sun causes sunburn, UV light is also absorbed by the tissue of the eye and can cause serious eye damage. Children are more vulnerable than adults. Because exposure is cumulative, direct contact with sunlight for even short periods of time can cause several long-term eye health problems, many of which begin symptom-free. For children, the first years are formative to their future vision and eye health, says Dr. Ahmed. The World Health Organization estimates that up to 80 per cent of a person's lifetime exposure to damaging UV radiation occurs before the age of 18. Conditions directly related to it include: cataracts, macular degeneration, cornea sunburn, tissue growths on the surface of the eye that can eventually block vision, as well as eyelid skin cancer and malignant melanomas in the eye. Doctors of optometry recommend a close-fitting, wrap around style frame that protects the eye and the skin surrounding it, as well as 100% UVA and UVB blocking lenses and a wide-brimmed hat tops. While tests have shown that inexpensive sunglasses can provide full UV protection, the quality of materials and consistency of the tints may be inferior. Such imperfections can distort children’s vision, causing a mild headache or eyestrain when sunglasses are worn. Before choosing sunglasses, children should have a thorough eye examination to ensure their eyes are healthy and to take any current eye conditions into consideration.